Mrs. Shoshana Schechter - "On Simcha and Sukkot: A Jewish Perspective on the Pursuit of Happiness"
Rabbi Etan Schnall - "Saying Goodbye to the Sukka?" Rabbi Mordechai Torczyner - "Of Paper Birds and Bottles of Wine"
Rabbi Joshua Flug - "Overhangs and Obstructions: Shady Problems Require creative Solutions"
Rabbi Yona Reiss - "The Mitzvah of the Four Species after the First Day of Sukkot"
Rabbi Aaron Cohen - "The Minhag of Women Saying Shehechiyanu When Lighting Neros Yom Tov"
Rabbi Lawrence Hajioff - "The Sukkah in Olam Hazeh and Olam Habah"
Rabbi Larry Rothwachs - "Get Your Head in the Clouds: The Timeless Message of the Sukkah"
Ms. Eliana Sohn - "Menucha: The Gift of All Gifts"
Rabbi Mordechai Torczyner - "The Malach of Hoshana Rabbah"
Rabbi Netanel Wiederblank - "The Message of Gog u-Magog"
Rabbi Mordechai Becher - "Symbolism and Rationale of Sukkot"
Rabbi Yosef Bronstein - "The Lubavitcher Rebbe’s Topsy-Turvy Sukkah"
Rabbi Shmuel Maybruch - "Closing Arguments: Reexamining What Matters On the Top of the Lulav"
Ms. Leah Moskovich - "The Sukkah Synthesis: A Sukkot Lesson from Avraham Avinu’s Life"
Rabbi Mordechai Willig - "The Mitzvah of Chinuch: Lessons from the Mitzvos of Tishrei"
Rabbi Reuven Brand - "The Uniqueness of the Sukkah: The Presence of Hashem"
Rabbi Michael Dubitsky - "V'Samachta B'Chagecha: And You Will Be Happy On Your Holiday"
Rabbi Akiva Koenigsberg - "Sukkot and the Oral Tradition"
Rabbi Dovid Hirsch - "The Joy of Yizkor"
Deena Rabinovich, PhD - "Hakhel: Reinforcement through Experiential Learning"
Rabbi Ezra Schwartz - "Shemitta and the Four Minim"
Rabbi Mordechai Torczyner - "A Succah for Two"
Rabbi Reuven Brand - "Ushpizin: Our Sukkah Guests"
Mrs. Chaya Batya Neugroschl - "Sukkat Shalom: Paradigms for Peace"
Rabbi Yona Reiss - "The Sukkah of Redemption"
Rabbi Ian Shaffer - "Sukkot in the First Temple Period"
Rabbi Hayyim Angel - "Yehezkel's Unique Prophecy of the War of Gog"
Rabbi Benjamin Blech - "The Sholosh R'golim and the Three Kinds of Love"
Rabbi Daniel Z. Feldman - "The Last Eight Pesukim in the Torah"
Mrs. Marjorie Glatt, J.D. 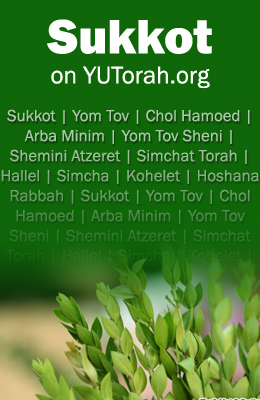 - "Etrog Essentials, And 8 surprising lessons on finding a spouse"
Dr. Yael Muskat - "Sukkot and Emerging Adulthood"
Rabbi Menachem Penner - "Chanukat ha-Mikdash: A Sukkot Celebration"
Rabbis Ari and Ronald Schwarzberg - "The Wisest of All Books: Interpreting Koheleth"
Dr. Ilana Turetsky - "Sukkot: Unity and the Role of the Aravah"
Rabbi Kenneth Auman - "Symbolism on Sukkot"
Rabbi Josh Blass - "Bringing the Succah into our Homes"
Rabbi Reuven Brand - "All You Need is Love"
Dr. Steven Fine - "When Bar Kohkba Ordered Lulavim"
Rabbi Joshua Flug - "Reading Kohelet on Sukkot"
Mrs. Chana Glatt - "Vanities vs. Progression: The Lessons and Joy of Koheles and Sukkos"
Mrs. Sally Mayer - "Why did Shemini Atzeret Become Simchat Torah?" Rabbi Yaakov Neuburger - "The Reconciliation of Sukkos"
Rabbi Zvi Sinensky - "The Patient and the Caretaker: On Sukkot and Compassion"
Rabbi Netanel Wiederblank - "Galbanum, Madison, and Citron: The Lesson and the Laws of the Binding of the Arbah Minim"
Rabbi Elchanan Adler - "Yom Kippur and Sukkos: Twin Symbols of Jewish Unity"
Rabbi Azarya Berzon - "Travelers on Succot"
Rabbi Kenneth Brander - "Scribing our Covenant: A Vision for Orthodoxy"
Rabbi Joshua Flug - "The Transition from Yom Kippur to Sukkot"
Ms. Miriam Krupka - "Moshe Rabbeinu: An Angel Amongst Men"
Mrs. Chaya Batya Neugroschl - "Zman Simchateinu: Understanding the Happiness of Sukkot"
Mrs. Deena Rabinovich - "The Season of Holidays and the Dedication of the Mikdash"
Rabbi Moshe Taragin - "The Beauty and the Least"
Rabbi Norman Lamm - "Koheleth: Looking Too Far Ahead"
Rabbi Hayyim Angel - "Introduction to Kohelet: Sanctifying the Human Perspective"
Rabbi Josh Flug - "Halachic Issues Commonly Encountered During a Hotel Stay on Shabbat and Yom Tov"
Mrs. Dena Knoll - "Once Upon a Time: The Story Told by the Chagim"
Rabbi Michael Rosensweig - "The Interface between Yom Kippur & Sukkot: Joy and Awe as Complementary Expressions of Avodat Hashem"
Rabbi Moshe Chaim Sosevsky - "Two of Repentance"
Rabbi Mordechai Torczyner - "The Transformative Power of the Succah"
Rabbi Meir Goldwicht - "Time of Meaning"
Rabbi Dr. David Horwitz - "Sukkot, Judaism and Universalism"
Rabbi Joshua Flug - "Blending in or Standing Out?" Rabbi Mordechai Willig - "Amira L'Nachri"
Aaron Steinberg - "Sukkot To-Go for Families"